Would you like to have an easy way to switch on and off the sound from your Discord to OBS? In today’s video CMDR Exigeous is going to show you how you can do so easily! There is quite a lot of videos about this subject. But this one i found to be the most clear explanation how separate audio tracks actually work and how you can adjust them for your different needs. – [Exigeous] Hello, Commander Exigeous again. 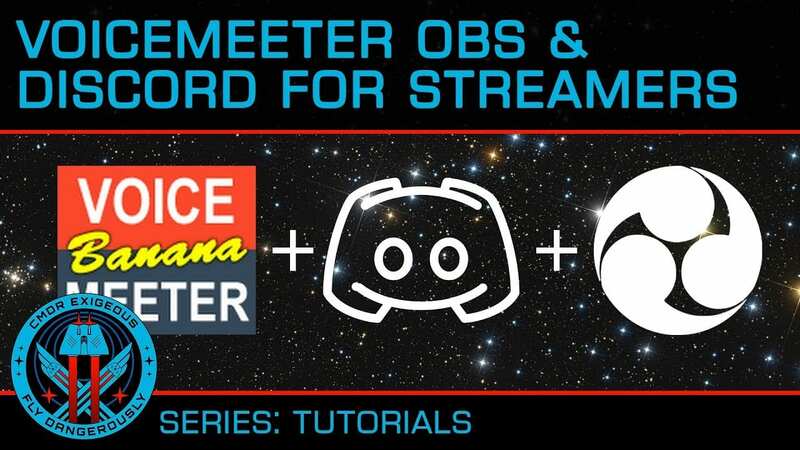 Today we’re gonna look at setting up VoiceMeeter Banana and OBS, so you can stream game audio without also streaming the audio from Discord. This is the best way to split the two apart, so your viewers can enjoy your game sound without sharing the private chat from your Discord channel. To get started, we’ll need a few pieces of software, all linked down below. We’ll of course need Discord, and for this tutorial will be using OBS Studio and VoiceMeeter Banana. Once you have all three installed, you should be able to take the defaults, get everything fired up and running. You may want to view this tutorial on a second device as we’re going to be making changes to audio, likely muting things in the process. We’re going to start with the more complex part, VoiceMeeter Banana. As I’m going to make this as simple as possible, we won’t be going into all the features of this powerful piece of software, just what we need to break apart our streaming and game audio. You’ll see we have three hardware inputs on the left, with two virtual inputs in the middle. These are what we’ll use to route our various channels. In the upper right, you’ll see our hardware outputs. In this tutorial I’m going to assume you have a single audio device, like a Realtek chip on your motherboard, although you could use multiple output devices if you’d like. Once you have VoiceMeeter Banana installed, right click on your speaker icon in the system tray, and choose playback devices. When the sound output opens, make sure you’re on the playback tab, and right click on VoiceMeeter input, and set it as default devices. Then right click on VoiceMeeter aux input, and set it as your default communications device. Once you’ve set VoiceMeeter as your default audio outputs, click on the recording tab and right click on VoiceMeeter output, and set it as your default device. Then right click on VoiceMeeter aux output, and set it as your default communications device. Once that’s complete, let’s assign our inputs and devices in VoiceMeeter. For our first input, click on select input device below hardware input one, select your microphone from the list. I suggest using the windows driver model, or WDM method. Assuming your mic is plugged in, you should now see activity on the meter. With your input assigned, let’s assign our output. To do this, click on A1 in the upper right hand corner, and select your output device. Likely your headphones are primary sound card. If you have more than one sound device, assign the second one to channel A2. In my example, I’m assigning my Logitech Bluetooth speakers to A2. Again, I suggest using the WDM selection. Next we’ll need to assign our microphone to the virtual output we want to send it to. I suggest using the B2 channel which will show has VoiceMeeter aux input later on. To do this, click on B2 on the hardware input one channel. To make sure you’re routing sound properly, click on the A1 channel and you should now be hearing your microphone live though your headphones. There may be a little delay due to VoiceMeeter processing, and while this can be reduced, we won’t be covering that in this tutorial. Note that if you’re using a laptop with a built in microphone, like in my example, you’ll get feedback when you select A1. Once you confirm this, deselect A1. Now we’ll need to send the virtual outputs to the correct devices. For VoiceMeeter VAIOs, select A1 to send this to the audio device we selected earlier. This will route your game audio to the primary device so you can hear it. You’ll want to do the same for VoiceMeeter aux channels, so that Discord audio will also be sent to that device. Next, let’s switch over to Discord and click on the gear icon in the bottom left to open settings. Under app settings, choose voice and video, and under input device, choose VoiceMeeter aux output. For output device, choose VoiceMeeter aux input. Basically, we wanna take input form the output, and send output to the input. You may need to restart Discord for this to take effect. Now, let’s make sure all is working properly by testing Discord. Confirm that you can hear others and they can hear you. You can use the slider for hardware input one, in VoiceMeeter Banana to adjust your transmit volume if you’d like. Once you confirm all is well with Discord, let’s open OBS and complete the process. With OBS open, click on settings. Select the audio tab, and make sure that desktop audio device is set to VoiceMeeter input VB Audio VoiceMeeter VAIO. For mic auxiliary audio device, select your hardware microphone device and click OK at the bottom right. In the primary OBS interface, you should see desktop audio and mic aux under the mixer section. If everything is routing properly, game audio will be routed to the default device, and your mic will be routed to the mic aux input. As Discord is now sending its output to the VAIO aux device, that will be picked up by OBS and therefore won’t be streamed. Finally, let’s say you want to send your desktop audio to Discord. You can do this by sending virtual input one to B2, which is the source that Discord is monitoring. Now any system sounds through your game, browser, music, et cetera, will be transmitted to Discord. A great way to impress your friends with your great or questionable taste in media. Hopefully this tutorial let’s you stream or record your favorite games while keeping your Discord conversations where they belong. Private, in Discord. This has been Commander Exigeous, thanks for watching. Suggested read: If you like to know more about good tools and DIY guides. Check out How to setup – Discord for your Twitch Channel and Mee6 Discord Bot Setup Guide.